The other day, for no particular reason, this song “Give Me Just a Little More Time” popped into my head; and I spent the rest of the day singing it over and over again. So, I need no greater excuse than to share it on my blog. 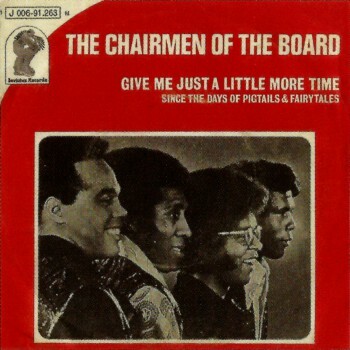 “Give Me Just a Little More Time” was a single by The Chairmen of the Board, released in 1970. This 1970 song was the debut release for The Chairmen of the Board, and peaked at number 3 in the US singles charts. It got to the same position in the DUK’s singles charts in September 1970. There was also a version by Kylie Minogue which was released in 1992 and got to number 2 in the DUK’s charts, but I much prefer the original, which is the version I have included here. Enjoy! At number 6 in Rolling Stone Magazine’s 500 greatest songs is “Good Vibrations” by The Beach Boys. This is one of my favourite Beach Boys songs, along with “God Only Knows (number 25 on this same list), which I blogged about here. 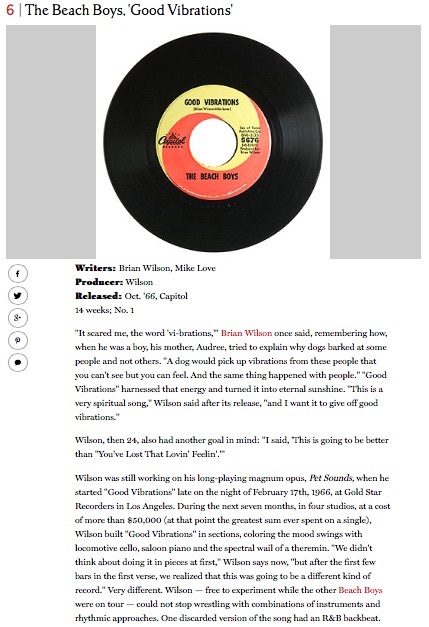 At number 6 in Rolling Stone Magazine’s ‘500 Greatest Songs of all Time’ is “Good Vibrations” by The Beach Boys. This song is a recording masterpiece. It was recorded during the recording sessions for The Beach Boys’ album “Pet Sounds”, rated the 2nd best album of all time (see my blog here about that album). Recorded in 1966 over a seven month period, with the most complex arrangements and overdubs of any song up until that point. It drove Brian Wilson to the edge of madness and despair. It did not appear on “Pet Sounds” in the end, but was rather released as a stand-alone single, not appearing on any albums. Here is a video of this fantastic song. Enjoy! 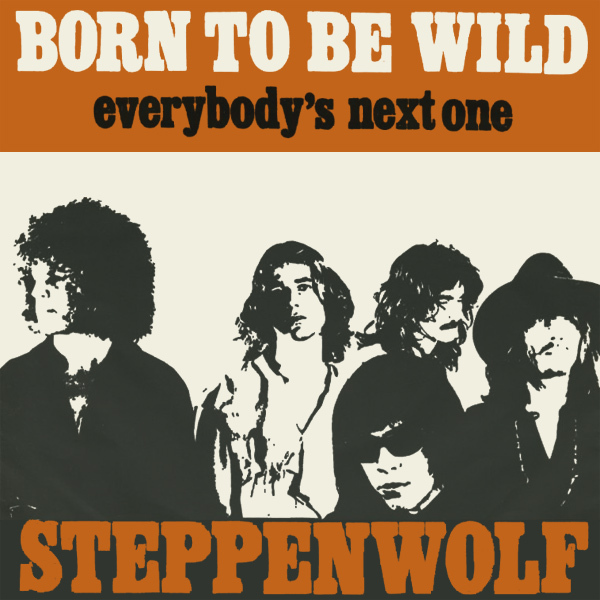 At number 79 in BBC Radio 2’s 100 best guitar riffs is “Born to be Wild” by American band Steppenwolf. This song was recorded in late 1967 and released in June 1968 and was written by band member Mars Bonfire (an unlikely name!). The song is sometimes described at the first heavy metal song. It got to number 2 in the US singles chart, but to only 30 in the DUK. It re-entered the DUK charts in 1999 and got to 18 this second time. It was their third single off their debut album “Steppenwolf”, and was their most successful hit song. In addition to being number 79 on this list, it is at number 129 on Rolling Stone Magazine’s 500 greatest songs of all time. Here is the video of this great song from the movie Easy Ride starring Dennis Hopper and a young Jack Nicholson (his first major movie), and is one of the reasons the song became so associated with the biker and hippy culture of the late 1960s. Enjoy! 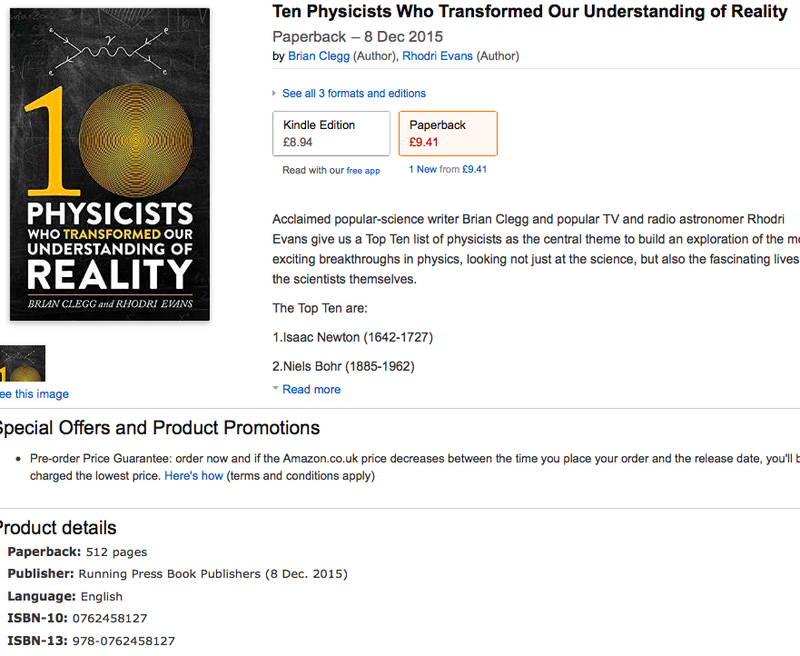 In the last week I have been putting together the final edits for the book that I have been writing with Brian Clegg – “Ten Physicists who transformed our understanding of reality“, which will be published later this year. One of the issues which we needed to clarify in this editing process were the dates of Newton’s birth and death. The reason this is an issue is that the calendar system was changed in the period between the 1500s and 1700s, which spans the years that Newton was alive. 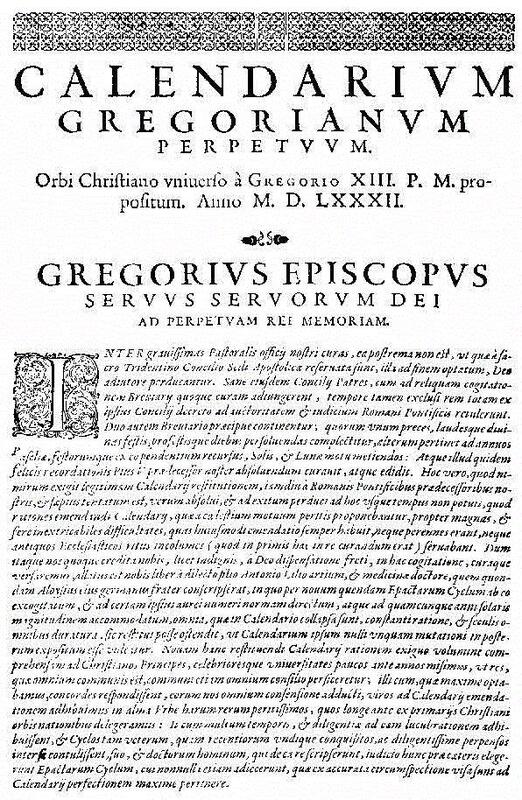 In 1582 the Gregorian calendar was introduced by Pope Gregory XIII, because the Julian calendar’s system of having a leap year every four years is not exactly correct (I will blog separately about the details of why having a leap year every four years is not correct). Different countries adopted the Gregorian calendar at different times, with Catholic countries adopting it before Protestant ones. Newton was born in England in the mid-1600s, and when he was born England was still using the Julian calendar. Under the Julian calendar, he was born in the early hours of the 25th of December 1642. But, by that time, many European countries were using the Gregorian calendar, and so had someone in e.g. France heard of his birth on that day (imagine radio existed! ), their calendar would have said that the date was the 4th of January! But, which year, 1642 or 1643? This is where another subtlety of calendars arrises, because starting the year on the 1st of January is something else that changed during this period. However, in France (for example) they switched to starting their year on the 1st of January in 1564 (prior to this France started their year at Easter), so again this hypothetical person in France who heard of Newton’s birth would have said the date was the 4th of January 1643 (for more about this see here). A similar confusion arises over Newton’s death. Under the Julian calendar, he died on the 20th of March 1726. At the time of his death, England was still using the Julian calendar, and was also still starting its year on the 25th of March (it switched to the Gregorian calendar and to starting its year on the 1st of January in 1752). So, had Newton died just 5 days later his date of death would have been the 25th of March 1727, which to any casual reader would imply he was a year older than he actually was. To someone in France, the date of Newton’s death would have been the 30th of March 1727. At number 7 in Rolling Stone Magazine’s 500 greatest songs is “Johnny B Goode” by Chuck Berry. This song was recorded in January 1958 and released at the end of March that year. It opens with one of the most recognisable opening guitar riffs in music, made even more famous to the post-1950s generation by the scene in the movie “Back to the Future” where Michael J. Fox’s character plays it at a school concert. The song got to number 8 in the US singles chart, and was one of the fist rock ‘n’ roll songs by a black artist to be listened to by white audiences. 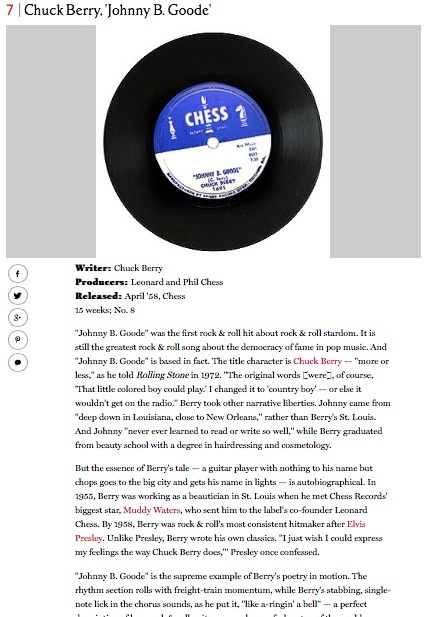 At number 7 in Rolling Stone Magazine’s ‘500 Greatest Songs of all Time’ is “Johnny B Goode” by Chuck Berry. The song is autobiographical, about a poor boy done good. Although Berry embellished some of the ideas. He was not from New Orleans Louisiana, but rather from St Louis, and he could read and write. The next biggest star to Elvis in the 1950s; unlike Presley; Berry wrote his own songs. He had a string of big hits in the late 1950s. His career took a bit of an enforced hiatus in 1962 when he was imprisoned for transporting a fourteen-year-old girl across state lines. When he was released in 1963 he had a few more hits; and I remember his “My Ding-a-Ling song in the later 1970s. Berry wrote “Johnny B Goode” whilst on tour, he said the riff had been inspired by a 1946 song “Ain’t That Just Like a Woman” by Louis Jordan. He created the driving rhythm in the song by speeding up a standard twelve-bar blues tune and playing just on the bottom three strings. Or sit beneath the trees by the railroad track. The 2015 General Election results – what about PR? Last week I discussed in more detail the results of the 2015 General Election in the Disunited Kingdom. As I mentioned a few times in that post, the DUK general election uses the ‘first past the post’ (FPTP) system. For anyone not familiar with this system, is simply means that the DUK is divided up into 650 constituencies (with roughly the same population in each); then in each constituency there is a vote. The party who wins the most votes in that constituency returns a member to Parliament, a Member of Parliament (MP). Back in the days when, at least in England, politics was dominated by two parties, the FPTP system worked reasonably well. But, if you think about it, even with two parties it is mathematically possible for party A to win more seats than party B, even though they get less of the popular vote. Nowadays the system is clearly flawed, as in addition to the Conservative and Labour party (who have dominated DUK politics for the last hundred years), the Liberal Democrats, the United Kingdom Independent Party, the Green Party and, in Scotland and Wales the Scottish Nationalist Party and Plaid Cymru respectively also stand. 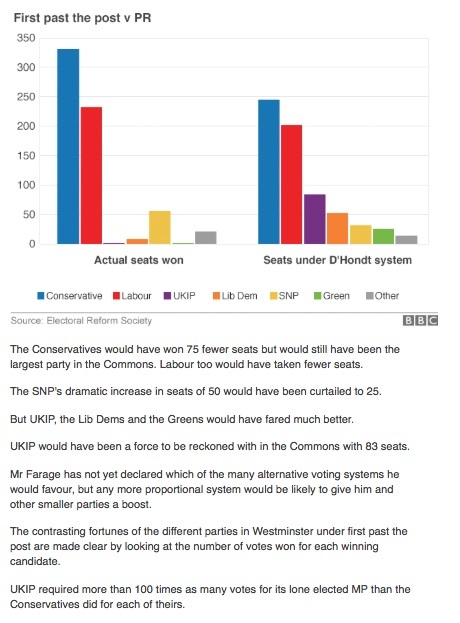 What would the seats in the new Parliament have looked like if the DUK had a system of proportional representation (PR)? I am very far from being an expert on PR, but my understanding is that there are several different types, so I am just going to discuss the simplest. I will look at the number of seats each party would have won in each of the DUK’s countries following the percentage of the vote they won there. As we saw in my blog last week, in England there are 533 seats. Of these, the Conservative party won 319 of the seats (59.8%), Labour won 206 (38.6%), Lib Dems 6 (1.1%), UKIP 1 (0.025%) and the Green Pary 1 (0.025%). In terms of percentages of the vote, the Conservative party won 41% of the vote, Labour 31.6%, the Lib-Dems 8.2%, UKIP 14.1% (more than the Lib-Dems, even though they only got 1 seat) and the Green Party 4.2%. If the election had been determined by a simple PR, then the Conservatives would have won 220 seats, Labour 169, the Lib Dems 45, UKIP 76 and the Greens 23 seats. Notice how different this is to the actual result, where UKIP and the Greens got only one seat! As we saw last week, in Scotland the Scottish Nationalist Party (SNP) swept the board, winning 56 of the 59 seats there. The other three main parties shared 1 seat each, with UKIP and the Greens not getting any. But, if Scotland had PR the results would have been quite different. The SNP got 50% of the vote, and so would have ended up with 30 seats, Labour got 24.3% and so would have got 14 seats, the Conservatives got 14.9% so would have got 9 seats, the Lib Dems got 7.5% so would have got 4 seats, UKIP got 1.6% so would have got 1 seat, and similarly the Greens would have got 1 seat from their 1.3% of the vote. In Wales, the Labour party returned 25 of the 40 MPs, with the Conservatives winning 11 seats, Plaid Cymru 3, and the Lib Dems 1. Neither UKIP nor the Greens won any seats in Wales. In terms of the vote, Labour got 36.9%, the Conservatives got 27.2%, the Lib Dems got 6.5%, Plaid Cymru 12.1%, UKIP 13.6% and the Greens 2.6%. If we translate these percentages into seats of the total of 40 we would get Labour with 15, Conservatives with 11, Lib Dems with 3, Plaid with 5, UKIP with 5 and the Greens with 1. In Northern Ireland, the DUP won 8 of the 18 seats, Sinn Fein won 4, the SDLP won 3, the UUP won 2 and “other” won 1. The percentage of the votes was DUP 25.7%, SF 24.5%, UUP 16%,SDLP 13.9%, APNI 8.6% and UKIP 2.6%. So, had NI been using proportional representation, the DUP would have won 5, SF 4, UUP 3, SDLP 3, APNI 2 and UKIP 1 seat. These numbers will be different depending on exactly how the proportional representation is done, but you get the idea. Below is a graph from the BBC, which went along with this story on PR. The clear parties to gain from a PR system would be UKIP and the Greens. UKIP only got one seat, but under PR this would go up to over 80! The Greens also only got one seat, but under PR they would have 25. With PR, the Conservatives would still have the most seats in the Commons, but would not have an overall majority. This, of course, would mean they would have to work with other parties to pass legislation. For the figures I have worked out, with 240 seats and 325 requiring a majority (there are 650 seats in total), even working with UKIP’s 83 seats would not have been enough. But, it would have been fairly easy for them to also get some of the 18 members from Northern Ireland on board, as the politics of several of the parties in NI is reasonably close to Conservative ideas in terms of economic policy etc. There was a referendum on reforming the voting system in 2011, and most people voted no. I wonder whether the same result would be returned if the same referendum were held now? 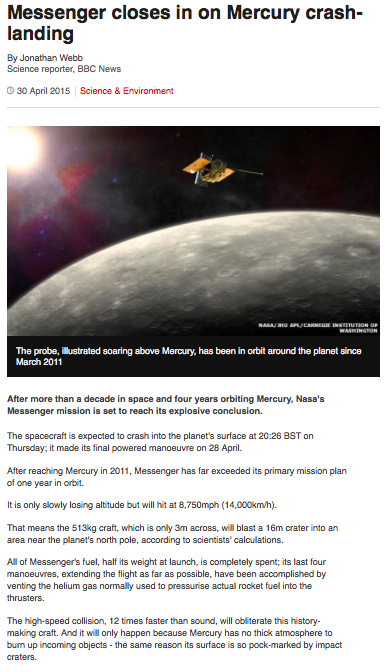 A few weeks ago, NASA’s Mercury MESSENGER space probe crash landed on the surface of the planet. This was not a mistake, scientists had deliberately sent it hurtling towards the surface of mysterious Mercury. It brought to an end a highly successful mission to learn more about the smallest planet in the inner solar system. 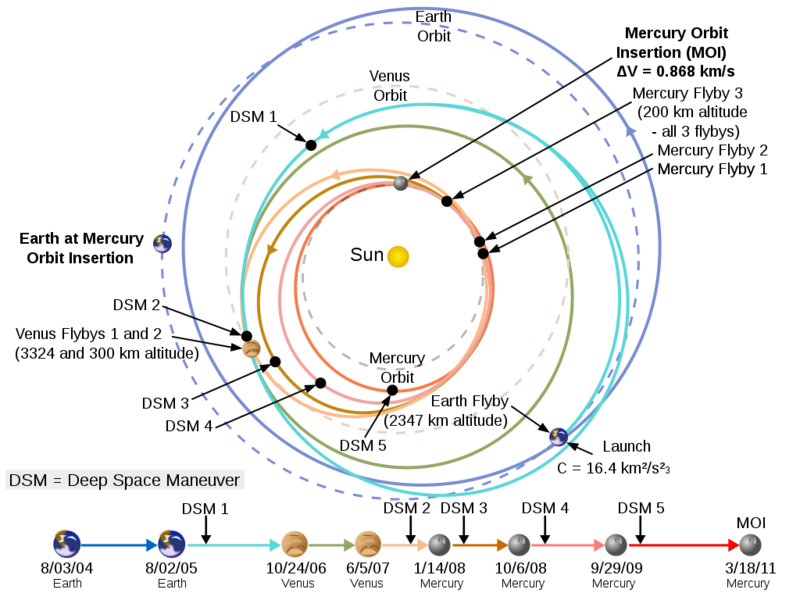 MESSENGER (MErcury Surface, Space ENvironment, GEochemistry, and Ranging) was launched by NASA in August of 2004 and arrived at Mercury in April 2011. You might be wondering why it took so long to get to Mercury, which is much closer to us than e.g. Jupiter. The reason is that the space probe could not fly directly to Mercury, otherwise it would have just whizzed straight past. Instead it had to go on a circuitous route so that when it arrived at Mercury it was moving slowly enough to be able to go into orbit about the planet. During this flight it flew past Earth once and past Venus twice. These fly-bys, as well as being used to slow down a space probe (in this case, usually they are used to speed them up), are also used to test the instruments. As is often the case with gathering more information than we have ever previously gathered, we now have more questions about Mercury than we have answers. How can such a slowly rotating planet (it rotates once every 58.6 Earth days) produce a magnetic field? Scientists are now going to have to wait a while to find out more about Mercury, the European Space Agency (ESA) plan to launch BepiColombo in January 2017, it will arrive at Mercury in January 2024.